(AP) -- The mysterious 4-year-old crisis of disappearing honeybees is deepening. A quick federal survey indicates a heavy bee die-off this winter, while a new study shows honeybees' pollen and hives laden with pesticides. Two federal agencies along with regulators in California and Canada are scrambling to figure out what is behind this relatively recent threat, ordering new research on pesticides used in fields and orchards. Federal courts are even weighing in this month, ruling that the U.S. Environmental Protection Agency overlooked a requirement when allowing a pesticide on the market. And on Thursday, chemists at a scientific conference in San Francisco will tackle the issue of chemicals and dwindling bees in response to the new study. Scientists are concerned because of the vital role bees play in our food supply. About one-third of the human diet is from plants that require pollination from honeybees, which means everything from apples to zucchini. Bees have been declining over decades from various causes. But in 2006 a new concern, "colony collapse disorder," was blamed for large, inexplicable die-offs. The disorder, which causes adult bees to abandon their hives and fly off to die, is likely a combination of many causes, including parasites, viruses, bacteria, poor nutrition and pesticides, experts say. "It's just gotten so much worse in the past four years," said Jeff Pettis, research leader of the Department of Agriculture's Bee Research Laboratory in Beltsville, Md. "We're just not keeping bees alive that long." This year bees seem to be in bigger trouble than normal after a bad winter, according to an informal survey of commercial bee brokers cited in an internal USDA document. One-third of those surveyed had trouble finding enough hives to pollinate California's blossoming nut trees, which grow the bulk of the world's almonds. A more formal survey will be done in April. "There were a lot of beekeepers scrambling to fill their orders and that implies that mortality was high," said Penn State University bee researcher Dennis vanEngelsdorp, who worked on the USDA snapshot survey. Beekeeper Zac Browning shipped his hives from Idaho to California to pollinate the blossoming almond groves. He got a shock when he checked on them, finding hundreds of the hives empty, abandoned by the worker bees. The losses were extreme, three times higher than the previous year. "It wasn't one load or two loads, but every load we were pulling out that was dead. 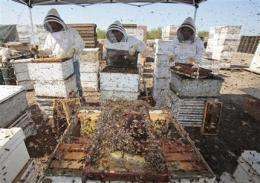 It got extremely depressing to see a third of my livestock gone," Browning said, standing next to stacks of dead bee colonies in a clearing near Merced, at the center of California's fertile San Joaquin Valley. Among all the stresses to bee health, it's the pesticides that are attracting scrutiny now. A study published Friday in the scientific journal PLOS (Public Library of Science) One found about three out of five pollen and wax samples from 23 states had at least one systemic pesticide - a chemical designed to spread throughout all parts of a plant. EPA officials said they are aware of problems involving pesticides and bees and the agency is "very seriously concerned." The pesticides are not a risk to honey sold to consumers, federal officials say. And the pollen that people eat is probably safe because it is usually from remote areas where pesticides are not used, Pettis said. But the PLOS study found 121 different types of pesticides within 887 wax, pollen, bee and hive samples. "The pollen is not in good shape," said Chris Mullin of Penn State University, lead author. None of the chemicals themselves were at high enough levels to kill bees, he said, but it was the combination and variety of them that is worrisome. University of Illinois entomologist May Berenbaum called the results "kind of alarming." Despite EPA assurances, environmental groups don't think the EPA is doing enough on pesticides. Bayer Crop Science started petitioning the agency to approve a new pesticide for sale in 2006. After reviewing the company's studies of its effects on bees, the EPA gave Bayer conditional approval to sell the product two years later, but said it had to carry a label warning that it was "potentially toxic to honey bee larvae through residues in pollen and nectar." The Natural Resources Defense Council sued, saying the agency failed to give the public timely notice for the new pesticide application. In December, a federal judge in New York agreed, banning the pesticide's sale and earlier this month, two more judges upheld the ruling. "This court decision is obviously very painful for us right now, and for growers who don't have access to that product," said Jack Boyne, an entomologist and spokesman for Bayer Crop Science. "This product quite frankly is not harmful to honeybees." Boyne said the pesticide was sold for only about a year and most sales were in California, Arizona and Florida. The product is intended to disrupt the mating patterns of insects that threaten citrus, lettuce and grapes, he said. Berenbaum's research shows pesticides are not the only problem. She said multiple viruses also are attacking the bees, making it tough to propose a single solution. "Things are still heading downhill," she said. For Browning, one of the country's largest commercial beekeepers, the latest woes have led to a $1 million loss this year. "It's just hard to get past this," he said, watching as workers cleaned honey from empty wooden hives Monday. "I'm going to rebuild, but I have plenty of friends who aren't going to make it."